I need some kind of cleaner to use in between my regular house cleaning. Something I could spray on and wipe off, but it will have to cut through grease too. We live near three major freeways plus the pollution and pollen in the city is awful, too. Everything seems to come through our filters. We've used expensive and cheap filters; no difference. It's so bad that we change our filters twice a month and that really doesn't help. If I dust in the morning, the dust is back in the afternoon. We've had the ducts cleaned, A/C, and no luck. That's why I'd like something I could just spray on and wipe off. The surfaces would be my cook top (enamel), mirrors, tile floors, glass, bathroom sinks, things like that. I could maintain them in between the weekly cleanings. Vinegar is a very good cleaner, I put it in a spray bottle from Dollar store, good luck. 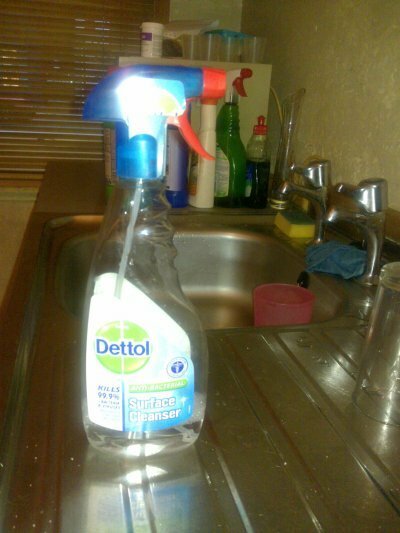 I use Dettol multi surface cleaner which comes in a spray bottle,and it's anti-bacterial. I, too, use vinegar but the product called Awesome that I get from the dollar store is really great. I dilute it about half and half with water or more water if you like. 97% isopropyl alcohol (found at the drugstore) is great. I use it all the time. Just spray on full strength and wipe off, no rinsing required - and it's a disintectant too. Great for all non-porous surfaces. I used to work in a hospital, and it's used all the time there. I take a rag and rinse with warm water, wring out and spray the rag with windex. This will work nicely on shiny surfaces. Adding an additional wipe-down with a microfiber rag will give it a real shine. If you need a stronger cleaner, dilute lysol or pine-sol and put in a spray bottle.